FranzCom now offers the market a real alternative to other conferencing solutions. No investment in expensive on-site conferencing equipment is necessary. Our pay as you go conferencing service is also a cost effective, but feature rich alternative to other hosted conferencing solutions. We have responded to our customer requests for a cost-effective, easy to use and powerful conferencing service which ensures that participants never miss a conference call again. At the time of your meeting, simply dial the conference access number, enter your conference holders pass code and speak your name at the recording prompt to begin your meeting. Each invited conference participant pays only the cost of the phone call to the conference call access number, dialling in with the agreed participant admission code which unlocks the door and joins them to the conference. Every caller uses the keys on their telephone keypad to control their participation in the conference and has the following functions available to them: mute and un-mute the phone handset; play a list of the names and the number of current participants; lock and unlock conference for security. Sharing a conversation or discussion with any group of chosen participants is now as easy as picking up a phone. With the personal conference line, location and setting are no longer a hindrance to group interaction with you colleagues, or any other organisation or group or individuals. It’s simple and user friendly!! 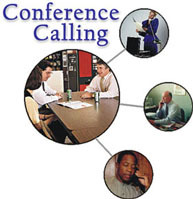 How can call conferencing be used? Allows you to keep people informed, involved and motivated / Get quick consensus and decisions / Running a business / Organising an event / Chairing committees / Training and motivating teams / Planning a party / Keeping up to date with the gossip / Socialising with friends without going out / Group discussion with friends/family. Make up and key in a 6-9 digit PIN number using the telephone key pad. Using FranzCom Conferencing could enable you to make substantial savings on the cost of your calls and is exceptionally easy to use. Save up to 80% compared to BT conference call. It is free to join. There is no monthly fee and no ongoing contract to sign. You keep your existing phone line and number and all call charges are included on your normal phone bill. * Calls made to 087 numbers from BT and Cable landlines are charged to the UK caller at 13p per minute. Calls from payphones and some mobiles may cost more. Callers from overseas will pay international direct dial rates to the UK, charged to them by their originating call provider.